Step into the world of gods and Vikings with Blood Rage, the newest tabletop game from Guillotine Games! This is one you don’t want to miss! In the middle of all the zombie craze, there’s been one genre that we’ve been ignoring for way too long: Vikings and Norse Mythology. Guillotine Games has found a way to make that up to those long-bearded Norse warriors. Blood Rage is the newest game to come from Guillotine Games, being funded by way of Kickstarter and hitting every single stretch goal they set in front of them. Guillotine Games, with the Zombicide games, have set themselves a high bar to meet (you can see our review of Zombicide here). What initially caught my eye was the incredibly detailed figurines for each of the tribes, as well as the different monsters, but after looking into the rules in more detail, I could tell this was going to be another amazing game, and not just a piece of art. Blood Rage’s figurines are incredibly detailed and extraordinarily designed. 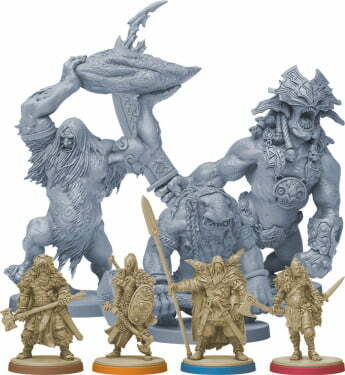 Blood Rage puts the player in charge of a viking tribe, complete with a leader, and a band of 8 warriors. The goal of the game is to gain the most Glory, which is typically acquired through winning battles, falling in Ragnarok, and completing quests. Due to some of the quests, and the nature of the game, sometimes it’s better to partake in a battle and lose on purpose, than it is to try and win, adding a layer of strategy unseen in many other games. The game’s rule book is somewhat lengthy, around 16 pages, but the rules boil down very simply. The game takes place over three Ages, where at the end of each, Ragnarok swallows a province, and takes it off the board. At the beginning of each age, each player is dealt 8 cards from that age’s specific deck (each age includes a stronger and more extreme deck, ratcheting up the stakes as the game progresses). Instead of keeping all 8 cards for themselves, the players then take part in the deck draft, my favorite and the most innovative piece of Blood Rage. Each player takes one card and passes the remaining 7 to the player on their left. They then take one card from the 7 in their hand, and pass the remaining 6 to the player on their left. This takes place until each player has selected 6 cards for that age, and the remaining 2 from that original 8 are discarded. This ensures the playing field is much more level, and allows players to build their hand in any way they see fit. One player might focus on quests and battle cards, while another player might keep monster and upgrade cards, the possibilities are nearly limitless. This introduces an element of calculated randomness, where players will have to tailor strategies to what is available to them, and to what the other Viking Tribes are aiming for. When passing along a set of cards, each player also has an idea of what the following player will probably take. The amount of pieces that comes with Blood Rage is extremely impressive, and leads to many different tweaks and modifications to how the game is played. The action phase is the bulk of the game, where the first player takes one action, then the player to their left takes an action, continuing around the table. Actions consist of placing figures on the map, marching them from province to province, pillages cities, upgrading warriors, or playing quest cards. Each action has a cost, which is paid by Rage, the game’s equivalent of action points, which is reset at the beginning of each Age. Leaders have no cost to Invade, while warriors cost rage equal to their strength. It might be smart to upgrade a Warrior so they can win any fight, but it might limit the number of warriors you can place on the board, or limit your other moves due to a lack of rage. There are several different monsters that you can summon, and bring into your tribe (your tribe can only house 2 monsters at a time), and each has a unique and beautifully detailed figurine to go along with it. It is the best kind of game, where it is simple to pick up and understand, but is incredibly deep, with several layers to master. Building a strong battle deck might seem like the best play, but if other players complete several quests, and increase their clan’s key stats, you will find yourself underpowered in the latter stages of the game. The game board is expansive, and lends itself to many different strategies between the Fjords and Provinces. The gameplay is absolutely fantastic, as it puts you in the mindset of a leader, deciding where the best area of the map is to attack, and who to try and hold at bay in the middle of pillaging. Pillaging takes place when one player tries to capture the reward of a province. If any other players have figures adjacent to that province, they can move one of their figures in to do battle. Each player then plays a battle card, and the one with the highest overall strength (figures’ strength plus the battle card’s bonus) wins. The losing figures are destroyed, but their battle cards are returned to their hands, while the winner’s is discarded. Some battle cards benefit losing, such as stealing a rage point, which gives a loser an advantage later in the round, or adding additional glory for losing a battle. It might seem like a good idea to destroy a battalion of enemies, but you might be giving an opponent the winning Glory to defeat you. Marching around a set of Vikings is a ton of fun, as is watching your figures amass on the board. Playing monsters and minions is extremely satisfying, as something like an Ice Troll can shift the entire landscape of the game. Overall, Blood Rage is another exceptional game from Guillotine Games. 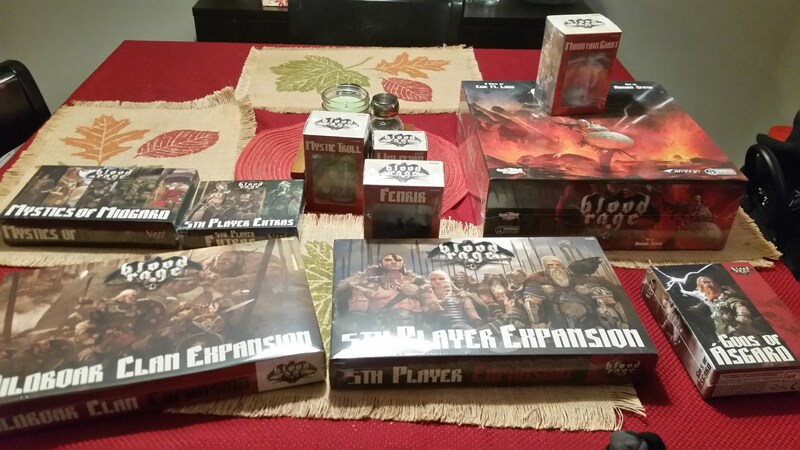 The Kickstarter hit every stretch goal, so I’m weighed down with tons and tons of extras to change and expand the game even further. It is best played with 3-5 players, and although it has a lengthy setup time, it is very well-paced at around 60-90 minute per game. With an extremely new and innovating hand drafting system, it changes up every single round, and does a great job of balancing the game. The simple to learn, hard to master gameplay hits the nail on the head, and is sure to have everyone at the table having fun, as you don’t really know where everyone is on the scoreboard until the very end. This is definitely a game to add to the collection. Guillotine Games delivers another win with Blood Rage. Despite the somewhat lengthy setup times, Blood Rage's innovative hand drafting, multi-faceted gameplay, and beautiful figurines deliver a level of quality rarely seen in a tabletop game. John lives in a small city outside of Portland, OR. He has been chasing achievements and trophies since his early teen years. After working at a small shoe company during the week, he enjoys spending time with his dog and wife, writing code, and crawling through monster-infested dungeons.